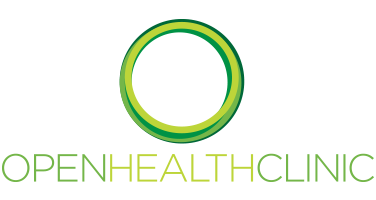 Here at OpenHealth we frequently see patients who are dealing with some cold or a cough, especially at this time of year. These are commonly attributed to bugs and infections, often caught from other people. Some of these illnesses result in us feeling too hot or too cold, and we know this as a fever. Despite what the song might say, however, a fever isn’t always “the nicest way to burn”! When we feel a fever knocking at the door we often turn to our medicine cupboards hoping to relieve ourselves or our children of these symptoms. However, if we understand the reason for a fever, perhaps we wouldn’t be as quite so quick to pop a pill and reduce it. As a population, we have become reliant on having access to medications that reduce symptoms but perhaps don’t tackle the causes. The medications that help reduce fever are known as antipyretics, and the most common are aspirin and paracetamol. Paracetamol is often used on its own but is also found in Calpol® not to mention most cold and flu remedies. Normal body temperature is 37 degrees and may fluctuate by 0.6 degrees during a day. This is within “normal” ranges. If your temperature rises above this and you start to experience other symptoms such a shivering, sweating and clammy hands, you may be getting a fever. • Rectal measurements are favoured in babies under three months old and are seen as the gold standard in hospitals. • These are followed in the accuracy stakes by armpit measurements in older children (and are recommended by the most recent NICE guidelines). • Infra-red forehead and ear thermometers are popular nowadays but are not seen as being quite as accurate. However, the speed and ease of use is an obvious advantage, as well as the colour coding on the screen – they commonly flash green, orange and red depending on the temperature being read. • Importantly, thermometers placed on the forehead are considered an unreliable way to take temperature according to the most recent NHS guidelines. Why do our bodies raise the temperature? When our immune system recognises the presence of bacteria in our body, a cascade of events happens. White blood cells release pyrogens which stimulate receptors in the brain to produce prostaglandins. These prostaglandins then signal our brains to raise body temperature. This slight increase in temperature is enough to cause proteins in our body to denature. They lose their shape, and since their shape determines their function, proteins become unable to function anymore. Since bacteria and viruses are full of proteins, hey presto, the immune system has helped you to eradicate them. Unsurprisingly, our bodies are smart, and evolution has taught us to encourage this process. How often do you find yourself putting on extra layers and getting under the duvet when you feel ill? These are acts that help us raise our core temperature and eradicate bugs. Why shouldn’t we prevent a fever? If we inhibit a body from running a fever by taking an antipyretic such as paracetamol then our bodies might find it harder to get rid of the bacteria, since the process of denaturing the proteins has been halted. 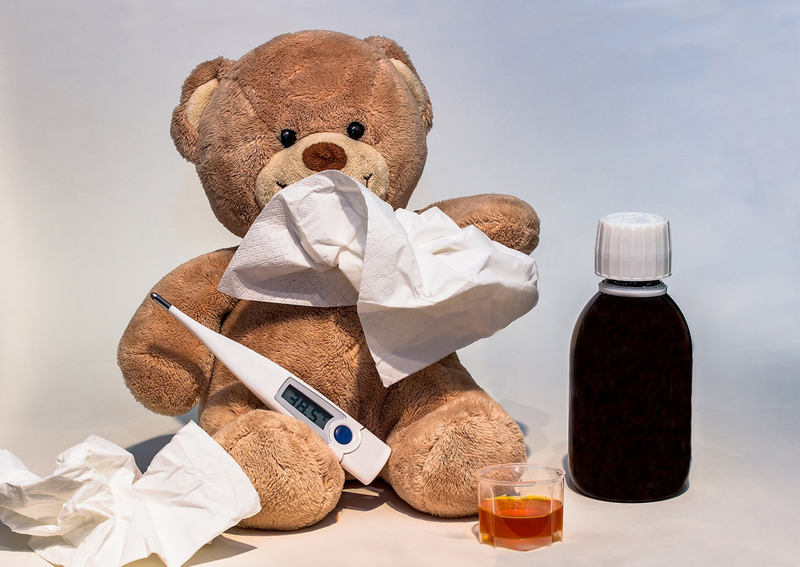 If you don’t believe us, when it comes to the management of fever, the current NICE guidelines (written for doctors to follow) state: “do not use antipyretic agents with the sole aim of reducing body temperature in children with fever”. They also say, “only consider using either paracetamol or ibuprofen in children with fever who appear distressed”. 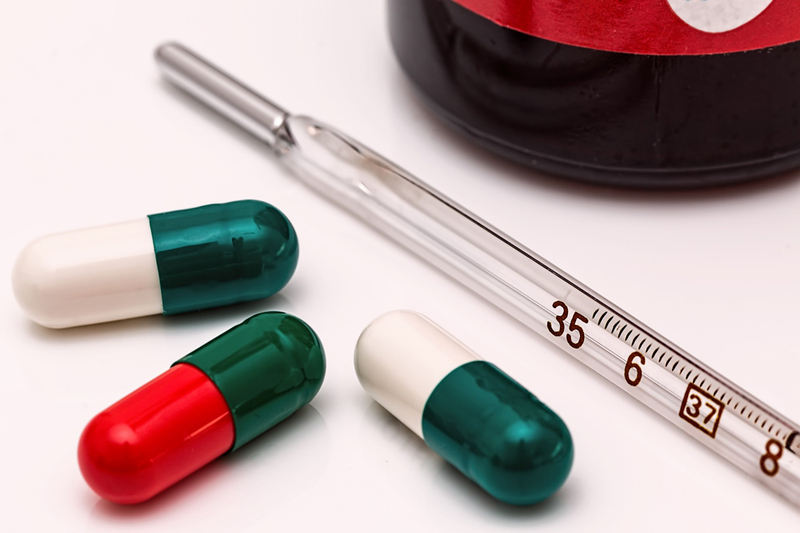 So, feeling a little hot or cold on its own is perhaps not enough to justify taking an anti-pyretic since the body is essentially managing things on its own. But if there are other symptoms such as irritability, lethargy or pain, then these suggest that what is going on is more serious. So we DO have to cool things down at some point?! Absolutely, yes. If our core temperature continues to rise without our body keeping a check on it, other, more vital proteins in our body might denature. This is a very real risk to the body and explains why we have become fearful of fever. So how can we know when to intervene? As long as a patient’s temperature levels off in the range shown in the graph, and then comes back down again, the body can be considered to be managing its temperature well. To be sure of this, it is sensible to take the patient’s temperature every 10 minutes and note the temperatures down. It might be that the body repeats this wave several times. However, if a patient’s temperature continues to rise, this can imply that the body is unable to bring the fever down itself. This is when antipyretics should be used, especially if this happens quickly. In turn, medical attention should be sought to investigate the underlying cause. As an aside, it seems sensible to know the resting temperature of the members of your family, so that you can make your decisions based on how elevated a temperature is above that person’s “normal” temperature. This removes any worry about whether your thermometer is perfect since you’re measuring a change in temperature, rather than worrying about decimal points. Good point. Be aware that in children under 3 months old, the threshold at which the body’s temperature is rising above where it can be self-maintained is lower, commonly 38 degrees. The same is true to a lesser extent between 3 and 6 months, where the threshold is commonly 39 degrees. After 6 months, the threshold is closer to 40 degrees. Another concern in small babies is how they can easily lose body heat, and end up hypothermic. This should be taken seriously and is due to the relatively large surface area of a baby compared to its mass and their inability to shiver in order to generate heat. Why do children get so many fevers? 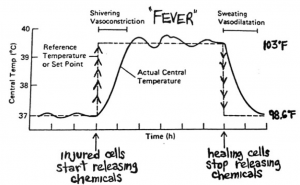 Children are great at spiking a fever and it is important that they do so in order to develop. These fevers typically occur just before they achieve a new milestone, whether this is growing a new tooth, developing new vocabulary or experiencing a growth spurt. The body raises its temperature prior to these life events to help ease the individual through this time of change. If such a fever is prevented from running its natural course, then the body, being mighty clever, will tend to initiate another one afterwards. These are the people who first get a cold, then a cough, then a stomach bug. Perhaps we should allow that initial fever to run its course – although keeping it closely monitored. This could be the difference between one day and 2 weeks off of work. It might seem like a leap of faith, but the use of antipyretics when they’re perhaps not required can hamper the body’s natural healing processes, and this can lead to illnesses becoming more prolonged than was initially required. We are absolutely not advocating the complete removal of aspirin, paracetamol and ibuprofen from your medicine cabinets, especially since they have other uses, such as in managing pain. But we are trying to give an overview of how the body is smarter than we sometimes give it credit for. With good monitoring, the body can be left to deal with a great many challenges, and the patient, despite having to suffer the symptoms of fever for the short term, might be able to prevent a longer-lasting condition. So, without medication what else can you do to help manage the symptoms? • Stay hydrated! Drink plenty of water, either plain or with lemon added. • Open a window! A steady supply of fresh air is vital for not only regulating temperature but also for general health. Fever is exhausting since it uses large amounts of energy to maintain a higher than normal body temperature. We know how tired we are after the fever has passed. As a rule of thumb, you should give yourself the same number of days to recover as the fever lasted for. This is especially important in children, who appear fine and are happy going back to school, but they will need looking after and more sleep than usual in order to recover and prevent a further illness. We’ve not written this article to advocate for the removal of paracetamol and other medications from your medicine cabinets, but rather to suggest that fevers should be more closely monitored so that in cases where the body is managing well, it can be left alone. This echoes current NHS advice, and we hope that we’ve outlined some of the benefits of and reasoning for following this strategy. Babies require closer observation and have lower threshold at which they should receive medical intervention. And of course, please don’t hesitate to seek medical advice should anything occur that you feel requires attention. More than anything that numbers can tell us, our own instincts are often the most powerful tool in medicine. Where does OpenHealth fit it? We are lucky to have in our team a highly skilled osteopath specialising in the care of babies and children. Osteopathy goes beyond muscle and joint pain and can help restore health to the body through the maintenance of a balance between intake and elimination. We also have an acupuncturist who is able to offer assistance to patients as they go through periods of illness and recovery. Acupuncture helps restore balance in the body, strengthens a patient’s sense of energy, and in some cases, can help clear any lingering pathogens that are still in the system. If you think that you might benefit from either Sian or Imogen’s expertise, don’t hesitate to pick up the phone and we will get you to see them as soon as we can.